How to be a winner 79% of the time and be up an average of 3.5%. Sounds enticing. I was reminded of the Santa Claus effect a couple of weeks ago and I found it too enticing to not look into and wanted to at least share my hard earned findings. Back in 2008 Simon Thompson, a long term and well respected writer for the Investors Chronicle, wrote a book called “Trading Secrets”. Amongst many investing and trading ideas he looked at the ‘Santa Claus rally’ – the idea that the FTSE 100 did exceptionally well during December. I thought it would be interesting to see if this still held true – in other words if the historical analysis had predictive power. He said that between 1980 and 2007 the average return over December was 1.99% and there were 22 up Decembers and only 6 down Decembers. 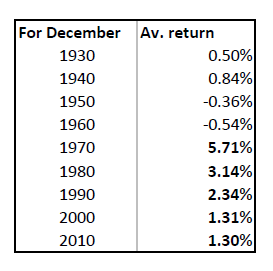 The markets are way up on 1980 so for any random month it is likely to show a return and to be up. Was December truly exceptional? 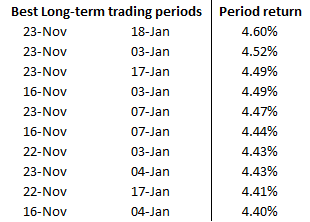 To dig deeper I pushed the analysis back to the 1930s – splicing on the FT 30 before the FTSE 100 started. 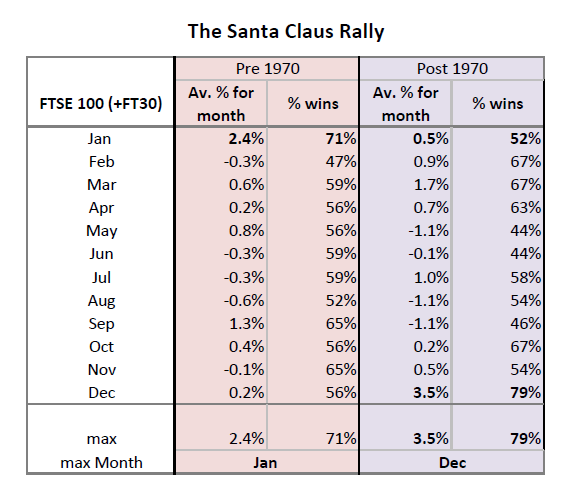 So, pre 1970 there was no Santa Claus rally – indeed the best month, by some margin was January. Post 1970 there was a clear winner: December. 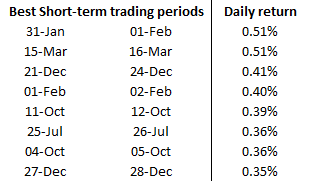 As a side observation there are a lot of months with bad returns between May and September. As the old adage goes: “Sell in May and go away, and don’t come on back till St. Leger’s Day”. To dig deeper I broke the data down by decades. So the effect was most pronounced in the 70s but it is definitely still there. In this case the historical analysis had predictive power. Interestingly this affect shows up, to a lesser extent, in the S&P 500. So, there you go – I offer these ideas up purely for interest and to perhaps make me feel slightly better about spending several evenings partaking in this analysis! I won’t be trading them myself this year. There is a small matter you may have heard of – Brexit – that, I bravely predict, will dominate our markets.